QUIZ: Which Civil War General Are You Most Like? I got Robert E Lee , see who you are like by taking the quiz here. 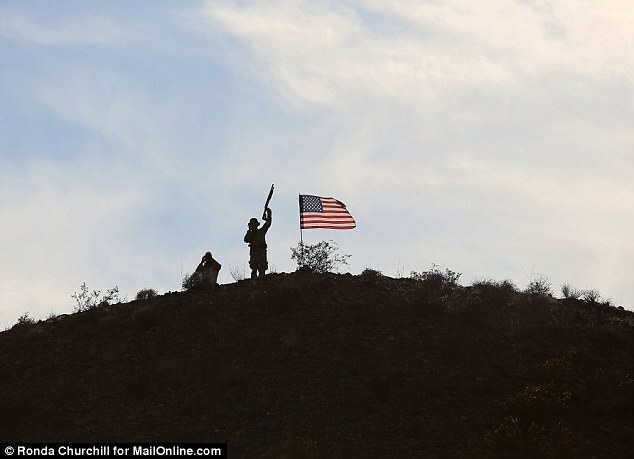 Will Executive Amnesty Be Fort Sumter 2.0 ? ” President Obama’s looming executive action on immigration reform represents a Fort Sumter-type moment, according to conservative icon Phyllis Schlafly. Fort Sumter, of course, is the sea fort in Charleston, South Carolina. It was there that the opening shots of the U.S. Civil War were fired on April 12, 1861. Schlafly at first considered comparing the Obama amnesty to the Japanese attack on Pearl Harbor, but decided that Obama’s plan is much more subtle. “ With Pearl Harbor, the American people knew what was happening,” she said. But Fort Sumter represented the beginning of a ruinous war, and Schlafly, like fellow conservative luminary Richard Viguerie, speculates that an executive amnesty might touch off a sort of modern-day conflagration. Obama plans to announce his unilateral immigration reform proposal in a televised address Thursday night. While no details are being released by the White House until then, analysts widely expect it to include work permits for up to five million people currently in the U.S. illegally. ” A document released by the U.S. Army details preparations for “full scale riots” within the United States during which troops may be forced to engage in a “lethal response” to deal with unruly crowds of demonstrators. ” The planned auction of a skull found at Gettysburg that purportedly was that of a Civil War soldier has been canceled following protests, and officials say the remains have instead been donated by the auction company for burial with honors. 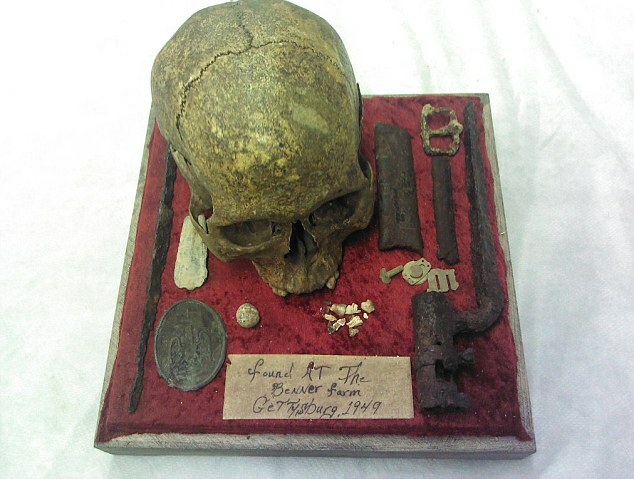 Estate Auction Co. of Hershey had listed the skull for sale at auction Tuesday in Hagerstown, Maryland, drawing protests from the U.S. National Park Service in Gettysburg and others. ” KNOW YOUR HISTORY: Memorial Day was started by former slaves on May, 1, 1865 in Charleston, SC to honor 257 dead Union Soldiers who had been buried in a mass grave in a Confederate prison camp. They dug up the bodies and worked for 2 weeks to give them a proper burial as gratitude for fighting for their freedom. They then held a parade of 10,000 people led by 2,800 Black children where they marched, sang and celebrated. Claim: Former slaves reburied dead Union prisoners of war in May 1865, thus creating the modern observance of Memorial Day. TRUE: In May 1865, free blacks in Charleston reburied dead Union prisoners of war and held a cemetery dedication ceremony. UNDETERMINED: The event referenced above is the origin of the modern Memorial Day observance. ” Memorial Day was started by former slaves on May, 1, 1865 in Charleston, SC to honor 257 dead Union Soldiers who had been buried in a mass grave in a Confederate prison camp. They dug up the bodies and worked for 2 weeks to give them a proper burial as gratitude for fighting for their freedom. They then held a parade of 10,000 people led by 2,800 Black children where they marched, sang and celebrated. Origins: The custom of holding observances (including the laying of flowers on burial sites) to remember and honor those who gave their lives in military service goes back many hundreds, if not thousands, of years. In the United States, that custom has long since been formalized in the creation of Memorial Day (formerly known as Decoration Day), a federal holiday observed on the last Monday in May to remember the men and women who died while serving in the United States Armed Forces. Traditionally, every year the President of the United States (or, in his absence, another high-ranking government official) visits Arlington National Cemetery on Memorial Day to honor all those Americans who have died in military service to their country by participating in a symbolic wreath-laying ceremony at the Tomb of the Unknowns. Women in Boalsburg, Pa., which has a claim as the holiday’s birthplace, began decorating graves each year as early as October 1864. In and around Carbondale, Ill., according to the Jackson County Historical Society, there are two markers making such an assertion in two different cemeteries. James H. Ryan, a retired Army colonel, has descended into the Logan archives and come out with a strong case for the town where he lives, Petersburg, Va.
Georgians dispute little of this. But they argue that the procession in the other Columbus was actually inspired by the events in their Columbus. Professor Richard Gardiner has lived here for only a few years, but he has joined with an accountant named Daniel Bellware, an avid history sleuth originally from Detroit, and together they have written an academic paper making the case for Columbus, Ga.
Association, a group organized to distribute clothing and other goods among the freed people. The women carried baskets of flowers, wreaths, and crosses to the burial ground. The Mutual Aid Society, a benevolent association of black men, next marched in cadence around the track and into the cemetery, followed by large crowds of white and black citizens. Although contemporaneous accounts from the Charleston Daily Courier describe and document the 1865 ceremony that took place there, and the event was one the earliest known observances similar to what we would now recognize as Memorial Day, whether it was truly the first such ceremony, and what influence (if any) it might have had on later observances, are still matters of contention. Professor Blight termed it “the first Memorial Day” because it predated most of the other contenders, but he noted he has no evidence that it led to General Logan’s call for a national holiday in 1868: “I’m much more interested in the meaning that’s being conveyed in that incredible ritual than who’s first,” he said. Follow GuideToPrepping.tumblr.com if you’re a prepper! ” California state government departments will be prohibited from selling or displaying items with an image of the Confederate flag under a bill that passed the Assembly on Monday. ” They train to the same standards as their active-duty counterparts and cost 60 percent less to maintain. Yet after years of defending freedom in Afghanistan, Arizona’s citizen-soldiers are being told they are unworthy of operating the Army’s premier attack helicopter. Army leaders recently revealed a plan to take away all 192 National Guard AH-64D Apache attack helicopters (24 assigned to Arizona), asserting that Guardsmen aren’t as ready to perform attack aviation missions as the active duty. That claim is inaccurate and statistically unproven. Adding insult, proponents of the Army’s plan say that the Guard can’t be trusted with the demands of an Apache mission and that Guard units were tasked with “less complex missions” upon arrival to the combat zones in Iraq and Afghanistan. Fact: the 403 Arizona Guardsmen assigned to the 1-285th Attack Reconnaissance Battalion at Silverbell Army Heliport in Marana flew the full spectrum of combat operations and fought valiantly in Afghanistan in 2007 and 2008. They also supported two company-sized deployments to Afghanistan in 2012 and 2013. Our Guardsmen flew the same missions as active-duty units. On one rotation they provided the sole Apache capability for an entire region of the country. They did this with a flawless safety record. Read it all . This is not a cost-cutting move . 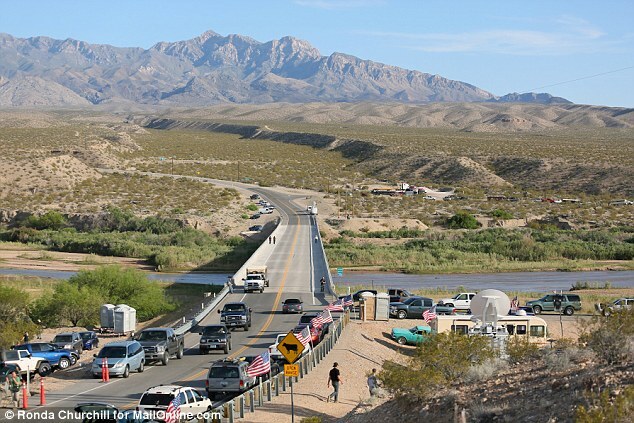 This is a blatant move to punish the states by an administration that is consolidating it’s power among a few “dependable” forces that it hopes will remain loyal to it when the SHTF and to defang any potential adversaries among the state forces . 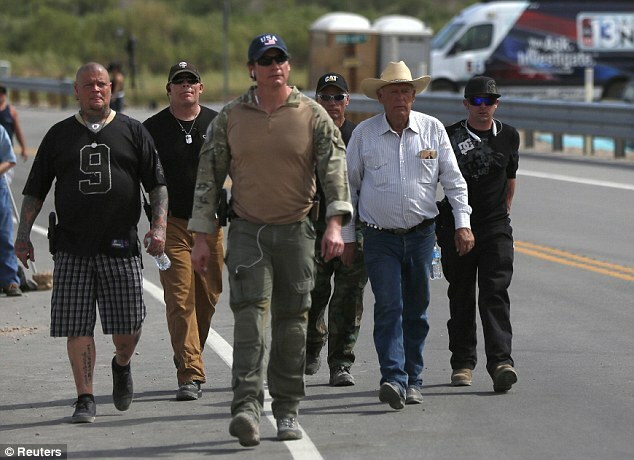 ” Hundreds of heavily armed militia members celebrated their victory over federal law enforcement officers on Saturday after they secured the release of Cliven Bundy’s captured cattle. 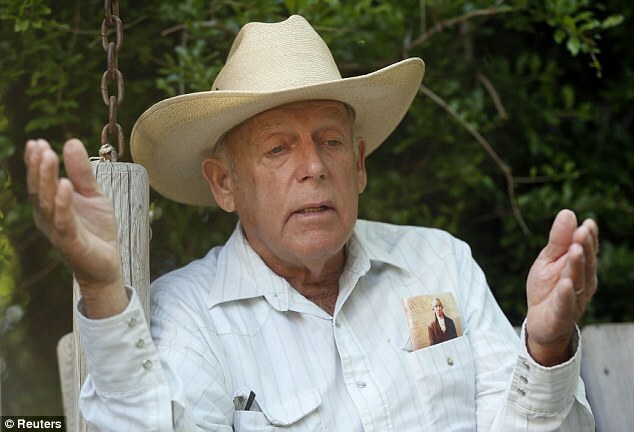 ” Bundy, 67, doesn’t recognize federal authority on land he insists belongs to Nevada. 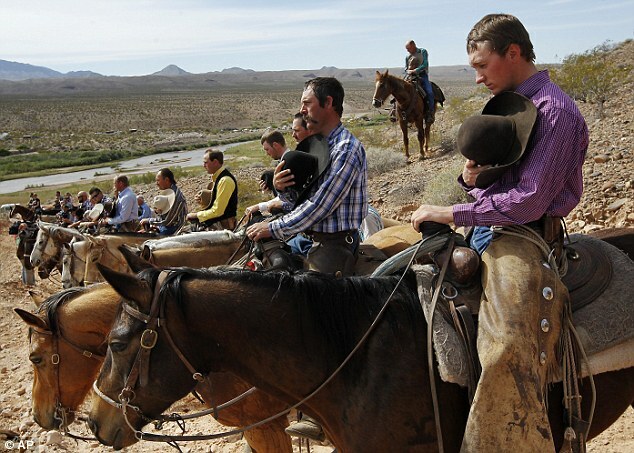 His Mormon family has operated a ranch since the 1870s near the small town of Bunkerville and the Utah and Arizona lines. ” Land managers limited the Bundy herd to just 150 head on a land which the rancher claims has been in his family for more than 140 years. ” The dispute that ultimately triggered the roundup dates to 1993, when the bureau cited concern for the federally protected tortoise in the region. 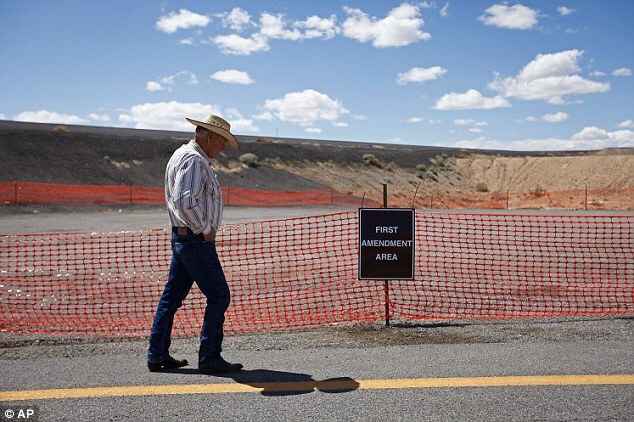 ” He earlier criticized the agency for creating “an atmosphere of intimidation” and trying to confine protesters to a fenced-in “First Amendment area” well away from the sprawling roundup area. 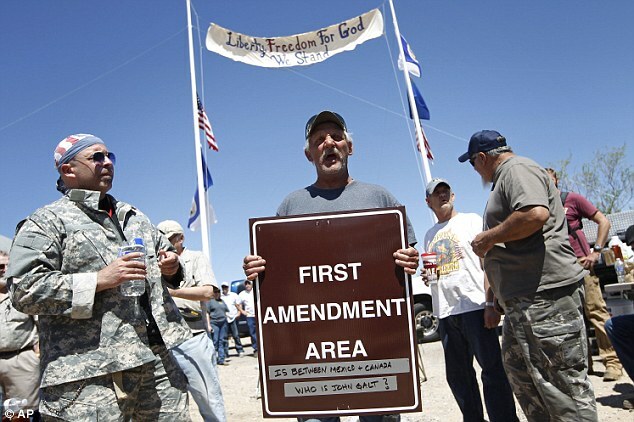 ” Anti-government groups, right-wing politicians and gun-rights activists camped around Bundy’s ranch to support him, in a standoff that tapped into long-simmering anger in Nevada and other Western states, where vast tracts of land are owned and governed by federal agencies. ” In an interview prior to the bureau’s announcement, Bundy said he was impressed by the level of support he had received. 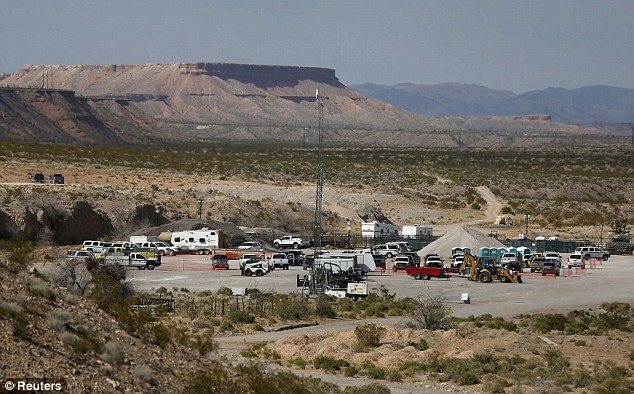 ” As it announced earlier today that it was backing off, the BLM said it did so because it feared for the safety of employees and members of the public. 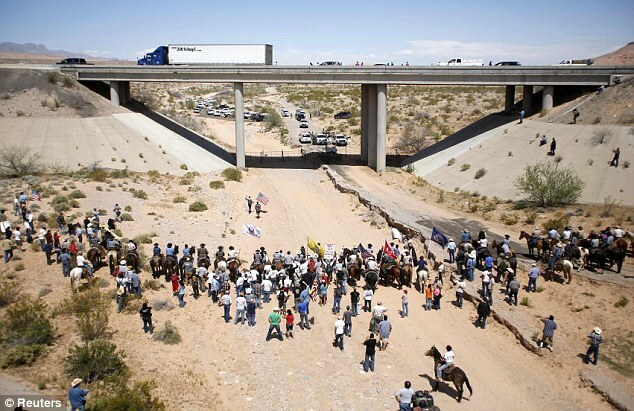 ” Earlier, the BLM had offered to pay Bundy for the cattle it has already rounded up, but protesters demanded they be released to the rancher. 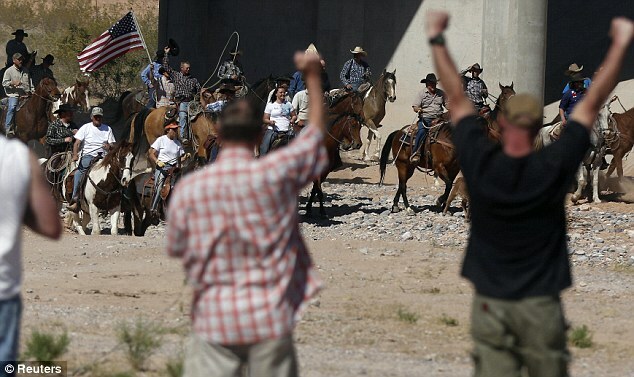 The cattle were being held in a corral near Mesquite, close to where the SWAT team were spotted. 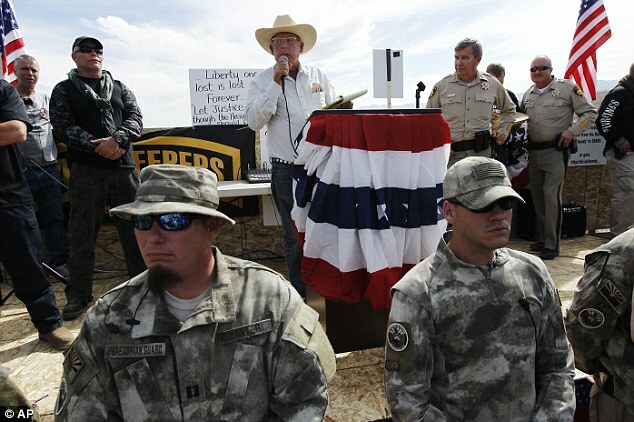 By 5pm ET, an agreement had been made that the bureau would release the animals back to the rancher. 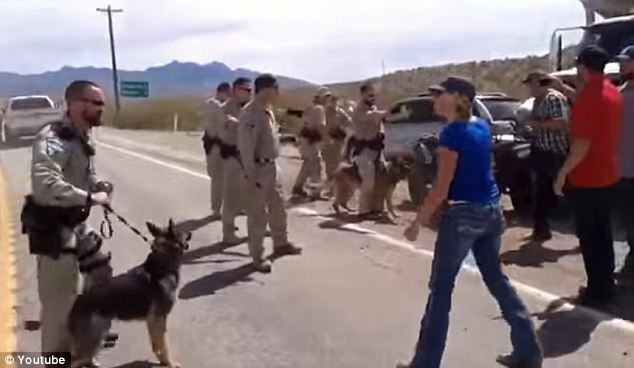 Nevada Police had pleaded with drivers Saturday afternoon to avoid the highway from Las Vegas to Mesquite, as protesters swelled out across the road, causing it to be cut off in both directions. 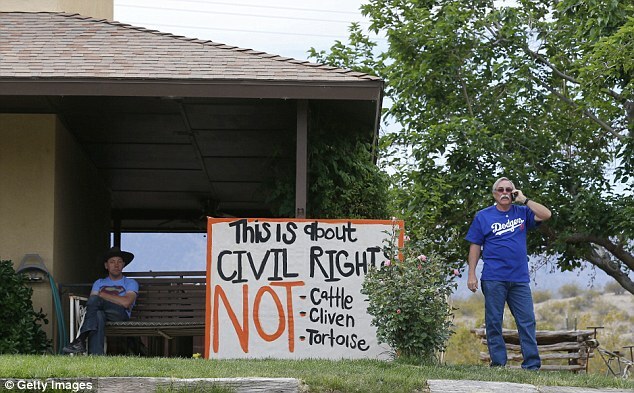 ” The dispute that triggered the roundup dates to 1993, when the BLM cited concern for the federally protected tortoise. 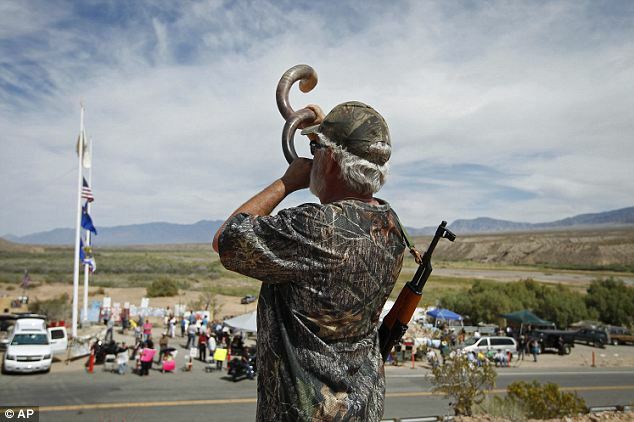 The agency later revoked grazing rights for Bundy, who is the last rancher in Clark County. 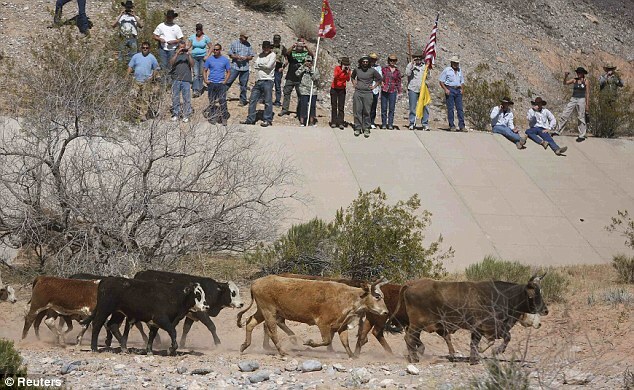 BLM officials say Bundy now owes more than $1.1million in unpaid grazing fees. 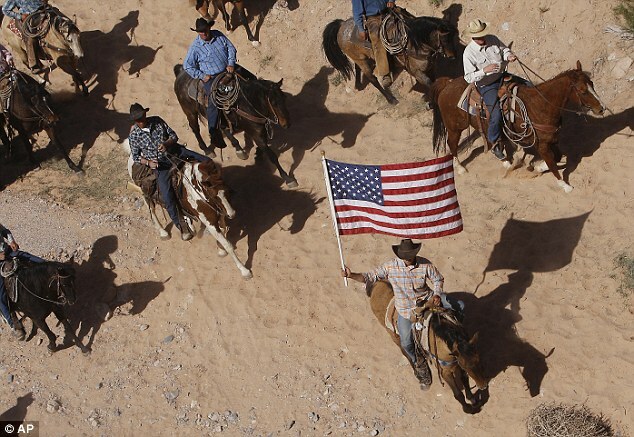 ” The BLM had earlier been said to be planning to sell the cattle it has rounded up and had offered to share the profits with Bundy. 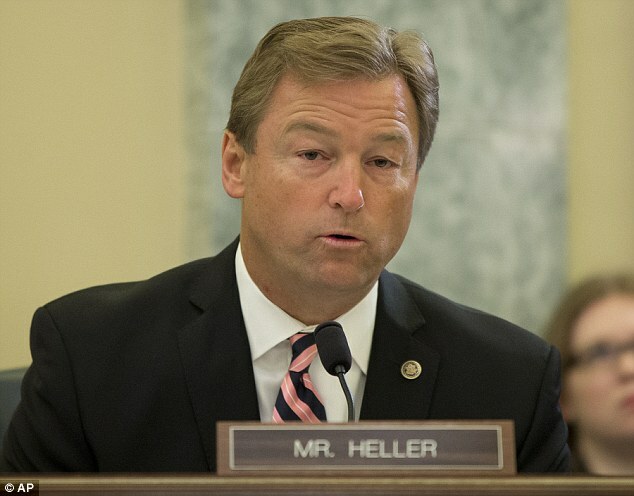 Sen Dean Heller, of Nevada, said he told U.S. Bureau of Land Management head Neil Kornze that law-abiding Nevadans such as rancher Cliven Bundy shouldn’t be penalized by an ‘overreaching’ agency. 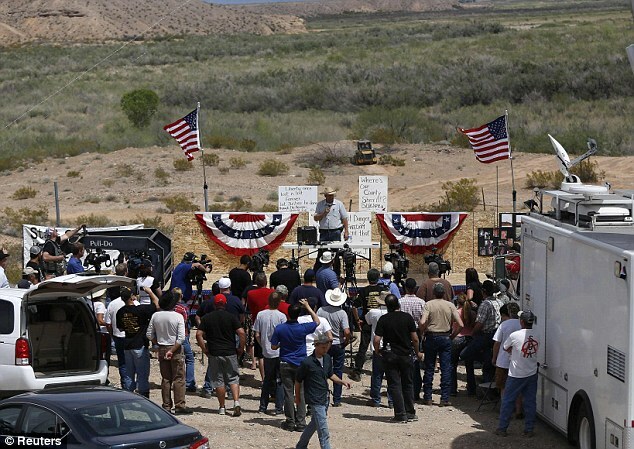 ” In Arizona, a congressman said he and several state Republican lawmakers considered traveling to Bunkerville to protest what they perceive as government heavy-handedness. 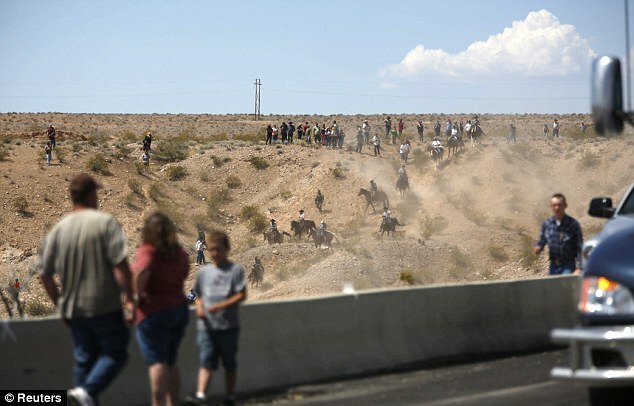 Senator Heller and Governor Sandoval have also said they were upset with the way the BLM was conducting the roundup. 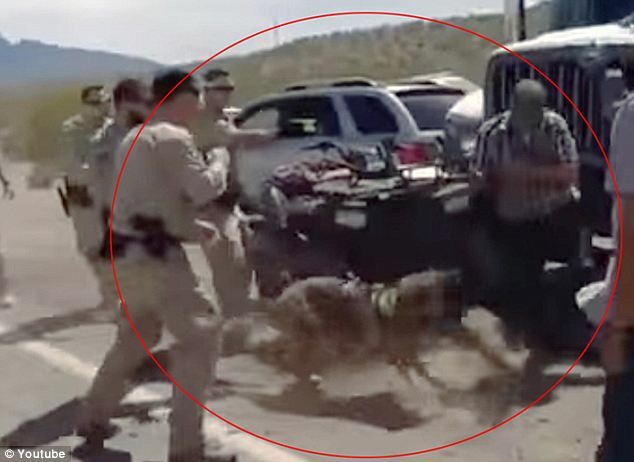 The remarks came as video emerged of Ammon Bundy, the son of Cliven Bundy, being repeatedly shot with a Taser and threatened by police dogs. 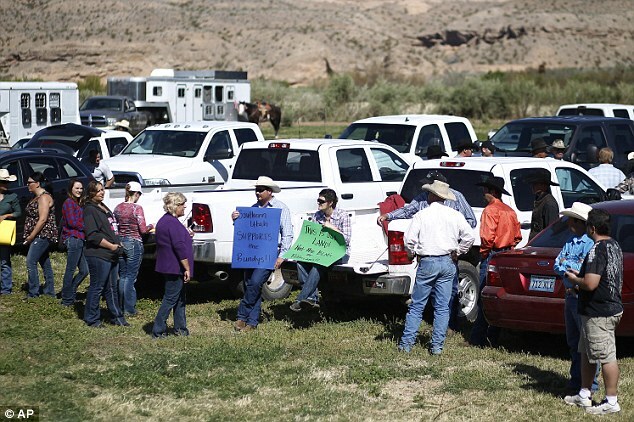 ” The increasing number of people arriving at the camp in support of the rancher came one day after other officials spoke out in favor of the embattled rancher. ‘Watching that video last night created a visceral reaction in me,’ Arizona state Representative Kelly Townsend told the Las Vegas Review Journal. 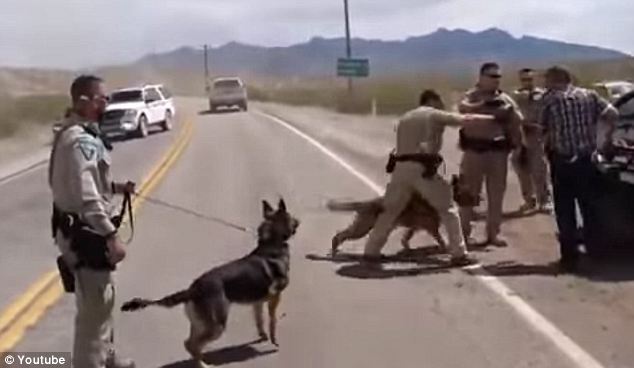 ” Outrage over the video prompted a change in the federal agents’ orders, according to a BLM spokesperson. ‘We are allowing people to congregate on public land as long as they don’t inhibit the operation,’ Amy Lueders said Thursday. 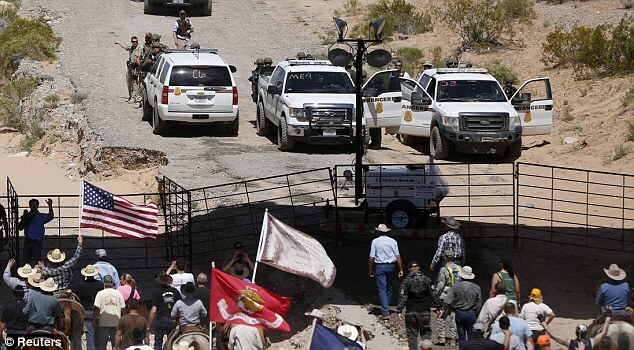 The week-long standoff started when federal agents swooped in Tuesday after Cliven Bundy, the last remaining rancher in southern Nevada, refused to remove his herd of 900 cows from land he claims has been in his family since 1870. 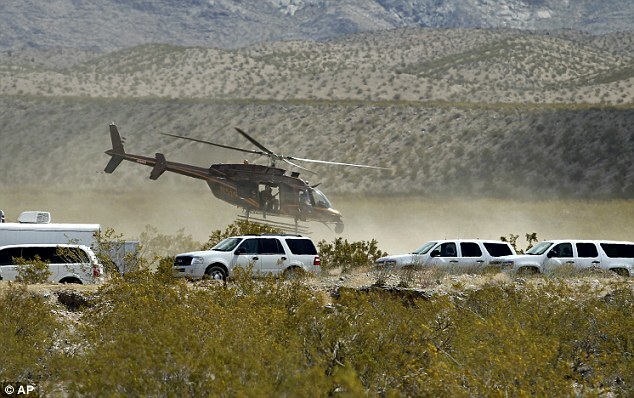 The heavily-armed federal agents, equipped with eight helicopters and backed-up by snipers, surrounded the Bundy ranch after the BLM attained a federal court order to confiscate the family’s herd. 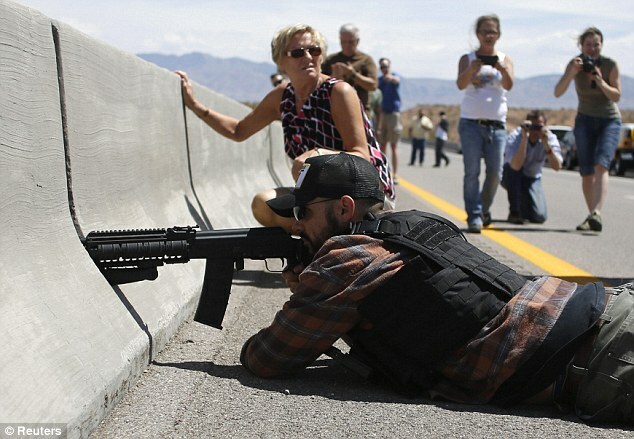 A Facebook post made by Bundy supporters told protesters to bring cameras and ‘film everything’ but ‘any rifles people may have with them need to stay in the vehicles’. 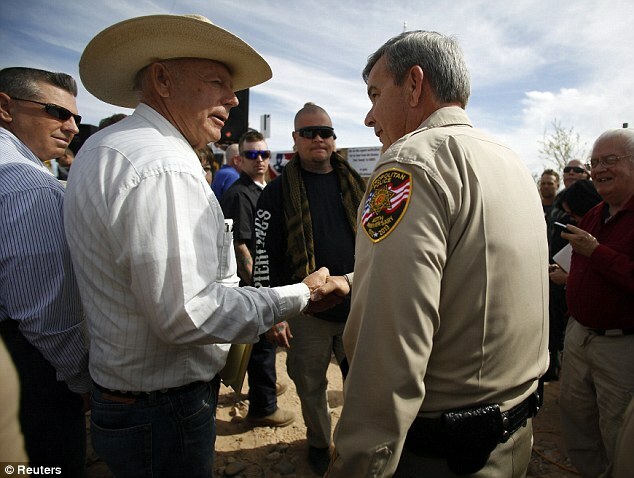 Sandoval, who criticized the tactics used by the BLM agents earlier this week, has urged everyone to show restraint. ‘Although tensions remain high, escalation of current events could have negative, long lasting consequences that can be avoided,’ he said Thursday. 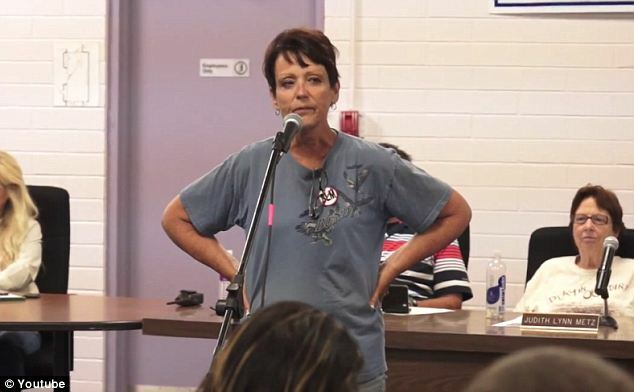 ” Margaret Houston, Cliven Bundy’s sister and a cancer survivor, told those gathered Wednesday at a town hall meeting that the scene ‘was like a war zone. I felt like I was not in the United States. She was not hurt in the incident, but said she was ‘shocked that somebody would actually do this. 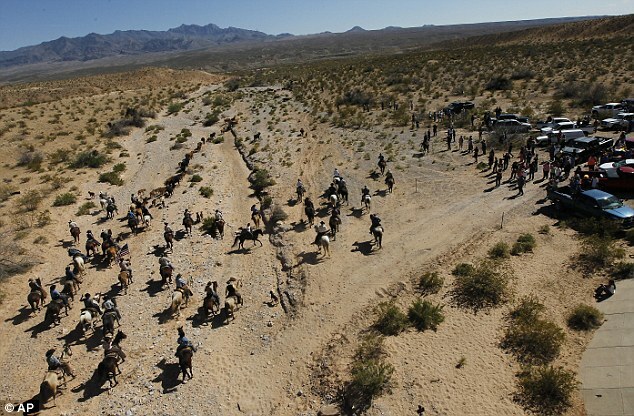 ” Cliven Bundy told InfoWars he and his family ‘gathered about 30 head’ of cattle. 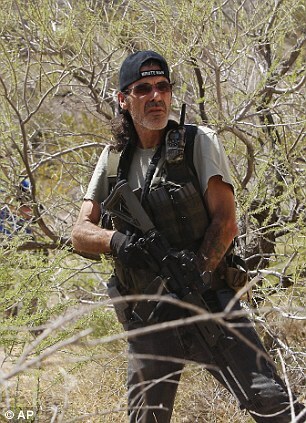 ‘We did have a small confrontation with them, but they didn’t have the forces to do a whole lot,’ he said. 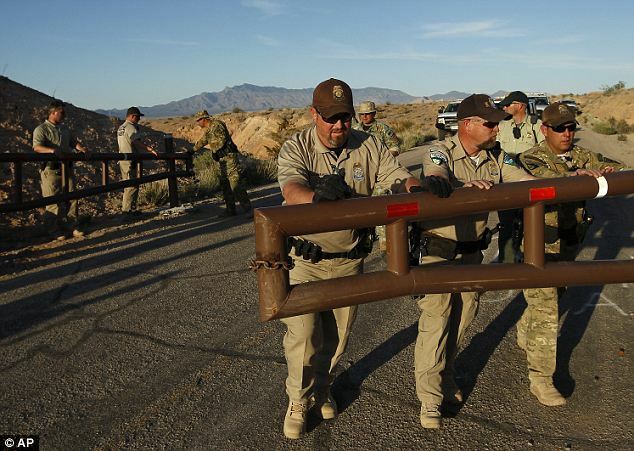 ” Multiple people have been detained while protesting the removal of the cattle, it is not clear if any charges have been pressed against them. 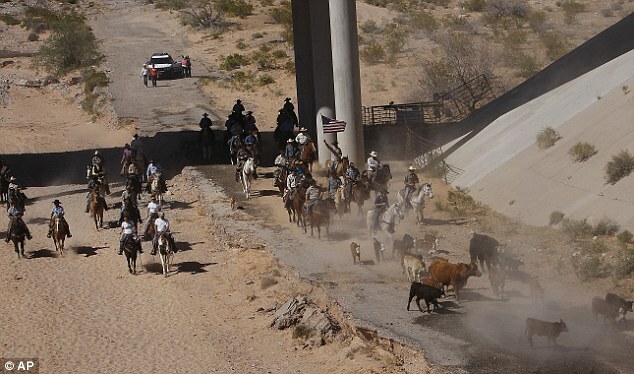 A handful of detentions were made at nearby Overton Marina, where cattle moved off the land are being held by BLM agents, according to 8 News Now. Clashes erupted soon after the armed agents began trying to impose their will on the protesters. The incidents did not deter the family from defiantly pressing on. 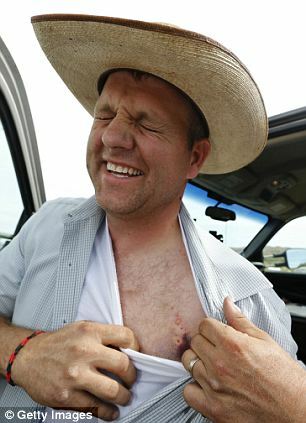 ‘These are heavily armed individuals with fully automatic weapons,’ Ammon Bundy told the station. 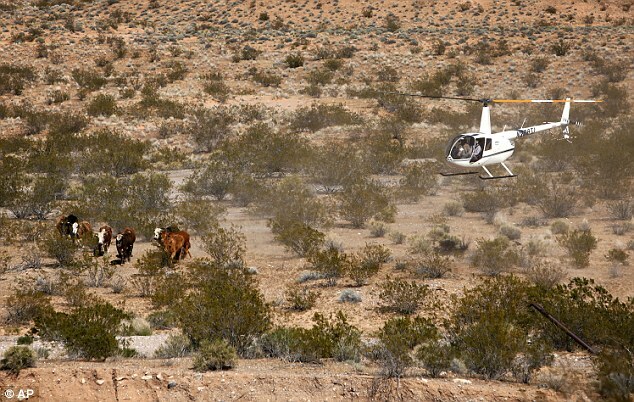 ” Eight helicopters were circling the land Thursday, and federal officials have seized about 350 of Bundy’s 908 cattle, according to various reports. It is estimated that impounding them will cost upwards of $3million. 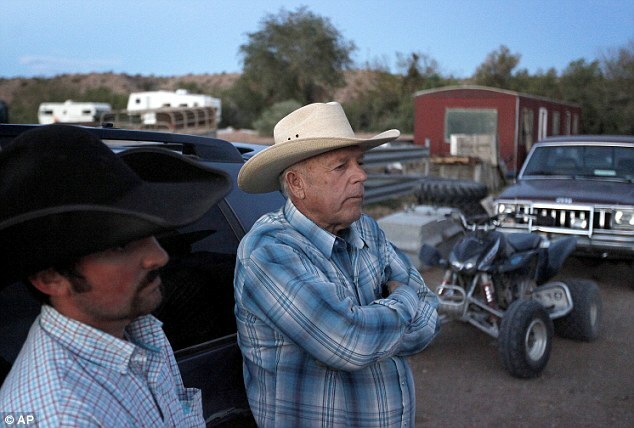 Bundy estimates his unpaid fines total about $300,000. 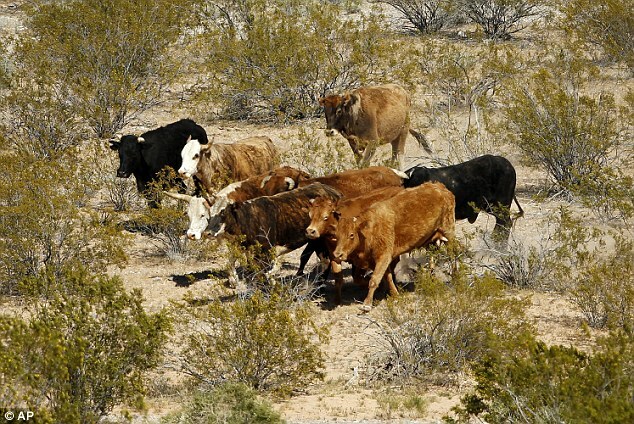 The BLM released a statement on its website earlier this week, saying, ‘cattle have been in trespass on public lands in Southern Nevada for more than two decades. 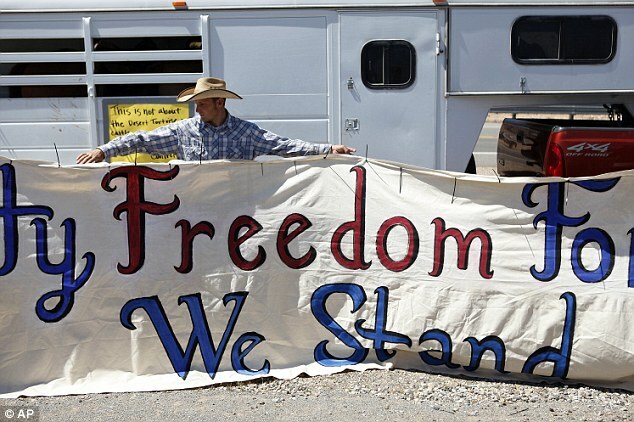 ‘This is unfair to the thousands of other ranchers who graze livestock in compliance with federal laws and regulations throughout the west. 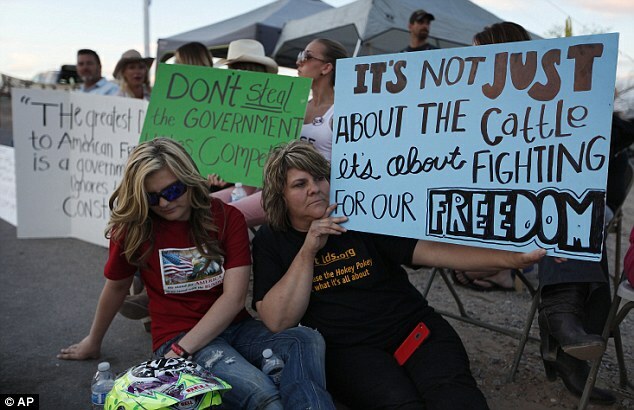 ” ‘No cow justifies the atmosphere of intimidation which currently exists nor the limitation of constitutional rights that are sacred to all Nevadans,’ Sandoval said in a statement released after business hours Tuesday. 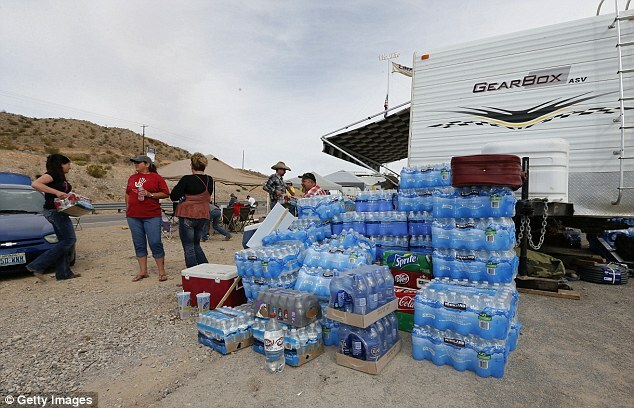 The Republican governor weighed in after several days of news coverage and radio talk show commentary about blocked roads and armed federal agents fanning out around Bundy’s ranch while contractors using helicopters and vehicles herd cows into portable pens in rugged and remote areas. 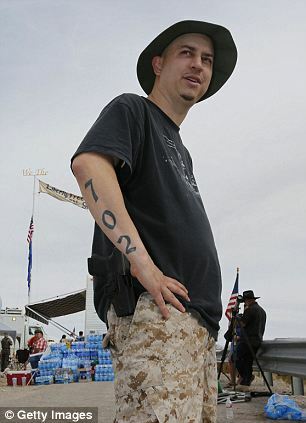 Sandoval’s comments came the same day the U.S. Senate confirmed Neil Kornze, a Nevada native, as the new BLM director. Many thanks to Daily Mail and the various photography agencies , AP , Reuters , Getty Images &Youtube for this post . 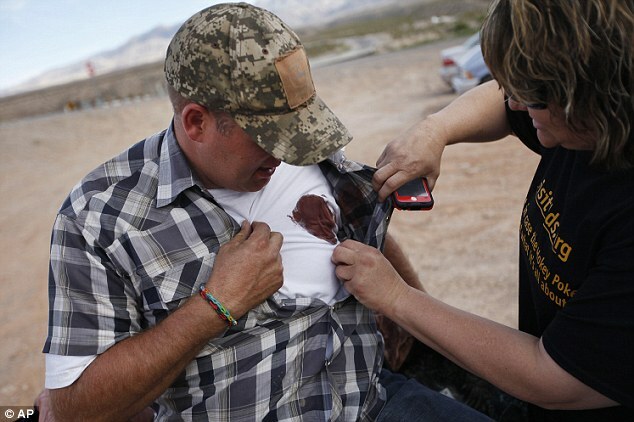 We very seldom copy a post from some one else in it’s entirety but we felt that this collection of photos and the accompanying text offered a wonderful encapsulation of the Bundy Ranch siege and Federal cattle rustle . Both pages are worthy of your support if you are a Facebook user . ” All of the Guard’s AH-64 Apache helicopters are scheduled to go to the active Army, and there’s nothing its top brass can do about it. Anybody who believes this is about saving money is deluded . This is a power grab pure and simple . 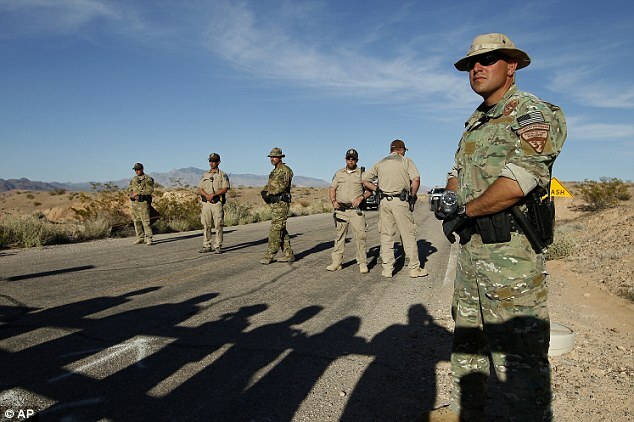 While the Feds go about disarming the State guard units so as to deny the states any offensive air assets in the event of an “emergency” , the same Dept of Defense continues to up-armor local police departments with billions in free ordnance . Here’s a cost saving idea General , how about you sell the excess MRAPS to allies , thus keeping them out of podunk towns across America and use the proceeds to let the National Guard to keep the Apaches . These ongoing deployments and re-deployments appear to be “battle space preparation” on the part of the Feds . Looking at this situation from another angle , the disarming of the Guard plays right into the Obama administration’s continued efforts to destroy American readiness . The Guard has played a pivotal role in the “War on Terror” for the past decade and now the fliers will be unable to train . Just another sop to our enemies as King Obama softens us up for his terrorist cronies . A Syrian Air Force Mig-29 sends three terrs to the land of the virgins as they video their own destruction . Heart warming stuff . ” Paul Taylor, 60, of Columbia, a retired federal government accountant, believes the scene is on Broadway, outside New York’s historic Grace Church. The day is Tuesday, April 25, 1865, 11 days after Lincoln was shot at Ford’s Theatre in Washington. ” If Taylor is right, scholars say he has identified rare photos of Lincoln’s marathon funeral rites, as well as images that show mourners honoring the slain chief executive. ” Need a quick reminder as to why war should be avoided at all costs? Spend an hour in the driver’s seat of a Syrian Army T-72 tank column as it spews destruction through Syria’s Darayya warzone. Then watch the rebels destroying the tanks. 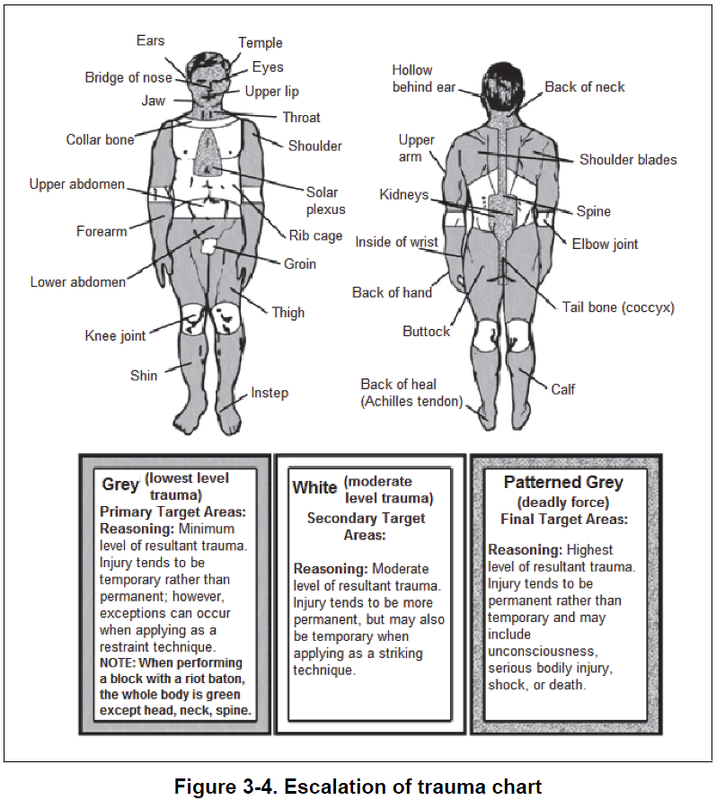 Warning: Although you can’t see the bodies, fighters on both sides are dying. This footage may upset you. ” Sydney – NASA’s new study says the crunch time for civilization could be very near. Usually, when civilizations fall, it’s a big deal. Whether or not anybody will even notice the fall of this particular civilization is highly debatable. NASA is sounding like an adjunct to the extremists of the Democratic party . While the drumbeat of income inequality is sure to grow louder and louder as the 2014 election nears we wouldn’t expect such a blatant show of partisanship from an allegedly apolitical scientific organization such as NASA , but such is life in Obama’s Amerika . ” You can see where this is going. Distribution of wealth, social inequalities, etc. One word would do- “Mismanagement”. The historical societies didn’t just collapse. They fell to pieces over time. At any point, they could have revived, but they didn’t. The fact is that we are not in disagreement with the concept of the “s**t hitting the fan” , on the contrary , we see no other possible result under our present leadership of ignorance , foolishness and corruption . No , where we take issue with the NASA prediction is in the root causes … NASA’s main focus deems “income inequality” and “unsustainable resource exploitation” as the culprit in civilization’s impending death , which is just another way of demanding MORE GOVERNMENT INTERVENTION . 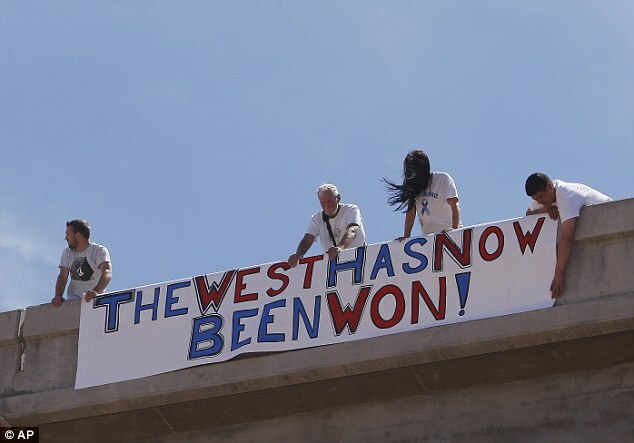 We here at YouViewed on the other hand feel that the demise of our way of life , should it come to be and things are not looking good , will be a direct result of an overabundance of State action rather than a need for more . Trying to shift the blame to two of the Left’s favorite stalking horses all but guarantees our imminent collapse by throwing more gasoline on the already raging pyre . The solution to our ills lies at the very fingertips of our innovative citizenry if only those fingertips weren’t being crushed under the boot heel of the Leviathan State .